What others should know: Clean the air chamber (where the piston slides in and out ) thoroughly, make sure there are no nics or burrs. Apply a thin coat of grease to all parts (rubber and metal) during assembly. Things I liked: The tool worked great. Things I would have changed: I can't recommend this kit. The pump piston cup was the wrong one for my old 317. Pyramid sent another. The Teflon check valve button is junk. The split washer that replaces the lead washer is useless. When you are attempting to insert the "loaded" valve assembly into the valve body the split washer expands due to the beveled cut on the nut's face. The split washer catches on the lip of the valve body preventing the nut from contacting the threads. I tried for hours and finally gave up. I was going to cut out a lead washer but decided to try a well greased "O" ring. The valve body went in place on the first attempt. However, the Teflon check valve leaked and it would lose the entire charge. My old original check valve looked ok so I reinstalled it. It is now holding a charge. I pumped it three times and let it sit for two days... it was still charged. There is a kit on eBay that has the original type check valve and lead washers. I would recommend buying one of those kits instead. Things I liked: The valve tool was invaluable. My lack of experience with difficulty sealing the exhaust portion caused me to use it several times. I tried to reuse the original gasket from the discharge end but the supplied o-ring worked great. The Teflon disc worked very well but I did clean up the seat and tap the disc to help it conform to he seat. The exhaust valve worked perfectly but I did clean the seat with steel wool before using it. Now the gun shoots with the power and accuracy that it had initially. Things I would have changed: I could not get the split PTFE washer to work. If spread if I put the nut in correctly -- with the taper in first. If I reversed the nut, I couldn't keep the washer centered. Maybe I should have tried gluing it to the nut with silicon adhesive before assembling it. The lead washer that was originally there seemed very deformed but I did manage to get it to work. The provided diagram could have been better. I had a cleaner version from correspondence with Crosman many years ago. I do not see how to attach it to this review. What others should know: The gun that I was repairing was a Sheridan Silver Streak. It had no serial number on it. My uncle gave it to me in the early 1950's. It had never been apart and worked great until this year when it started to hiss air through the discharge port and into the breech. I studied YouTube videos before working on the gun. I did resurface the inlet seat because it appeared to reflect small defects when shining my flashlight on it. I did that by cutting off a 3/8 dowel rod, gluing 320 grit wet/dry sandpaper to the end. I piloted the dowel by drilling a 3/8 hole in a larger dowel that was not much smaller than the main tube. I lightly spun the 3/8 dowel a few times until the seat did not show any defects. I did seat the Teflon by tapping it with a punch. Things I liked: The valve removal tool is high quality. I am very pleased with this rebuild kit as you get some rebuild components and the tool. Things I would have changed: Would be nice to get fore and aft valve seals. Things I liked: This kit repaired a early 90s benjamin 392 that wouldn't hold air anymore. Fairly simple repair for somebody who has a little mechanical skill and has never taken an air rifle apart. You can figure it out. Things I would have changed: The directions that come with the kit are almost worthless. Time to print fresh and stop making copies. Very blurry and the schematics online is what got this rifle back together for me. Things I would have changed: Lots of reviews complain about the pic and instructions being sub-par. OK, not great but they'll work and you can also get pics online. What others should know: Don't shoot your eye out. Things I liked: Good product well worth the money! Product arrived in very little time. Exactly what was described is exactly how the product came PERFECT FIT! What others should know: If you choose to rebuild this type of air gun definitely purchase this kit because its everything you will need including tool!!! This is the right way to go!! Things I liked: Good value for parts and mandatory tool. Could not do it without the tool. Never repaired an air gun before, but went smoothly. Most challenging part was getting the nut started again when reassembling. Things I would have changed: The parts diagram blowout that came with the package is a great thought but the image was fuzzy and very hard to read due to the image being blown up so much. Need an image that is in better focus. What others should know: Watch an online video or two so you are familiar with gun disassembly and assembly and for helpful hints and reminders before jumping in. Things I liked: Kit has all parts needed, including the specialty tool needed to install the valve parts. Easy to follow instructions also included. Things I liked: The parts were all very clearly new and definitely well made. Everything fit just right and the included tool is invaluable. I suppose one could machine such a tool but it would be tricky. I also like that it came with parts for various models. I used this kit in a Benjamin 347 from 1979 and I am very pleased! Things I would have changed: The photocopied instructions are vague and a little rough so it would be nice to see an overhaul of that. I had to watch a few YouTube videos to really understand what was going on. The teflon o-ring did fold over itself a bit as well. This isn't a problem (as the kit definitely works) but some mention of that in the instructions would've eased my nerves a bit. What others should know: Watch a few videos of how to do this repair and read as many resources as you can that describe the internals of your particular model airgun (especially if you have a single port valve with a notch). Practice getting the valve nut in and out several times before you add the springs and maybe mark the installation tool at the point where the threads for that nut are to save yourself some frustration. You're going to love this kit. It does a great job of resurrecting old Benjamins! Things I liked: The kit worked well for me. All of the necessary pieces came in the kit. Things I would have changed: The instructions were a bit unclear for me as I had never disassembled the rifle previously. After a few tries I got everything apart and successfully back together, but it took a few attempts and guesses as to what was meant. What others should know: If this kit will help, go for it. My gun now shoots well, no longer leaks air pressure. I'm happy to have it back! Things I liked: Great kit. I've used these on 6 rifles and never had an issue. Things I liked: It's nice that there is still some help out there on older items that have personal meaning, even if not significant financial value. Things I would have changed: The diagram is almost illegible, and as such is almost worthless. The part that is a replacement for the original check valve seal is made of a hard teflon and it cracked when I put it into the chamber. The tool that is used to take the parts out of the pressure barrel is the best thing about this kit... I paid for the shipment to be within four days and it was twice that many days getting here....not a big deal but still a failure to make good on a promise. I was told that my money would be refunded but won't know if that happened until I get my next card statement. I am not happy to make this report, as I do not mean to harm anyone.....but I do hope that it will inspire the supplier to raise their game. Things I liked: I loved this rebuild kit! Very user friendly for this type of gun. What others should know: The new check valve spring was a pleasant surprise. The O-ring for the back of the exhaust valve speeded up the install on my opinion. Things I liked: Kit was awesome! Things I would have changed: The instructions included are copies of copies, HARD to READ! Make us some digital ones that people can download and use please. An 1/8" nut driver should be an option for the bolt lug removal. No stores locally had one, but a buddy had an old camera tool kit that saved the day. Things I liked: This is a great kit that got my 1993 benjamin shooting again. I would add to the other reviews that I have read that you just need to take your time. This job will take a little time to complete right. All the pieces were included and if you are somewhat handy it is an easy build. And if you are looking at repairing an old benjamin this kit will do it. But once again, my advice is to take your time amd make sure everything is cleaned and lightly greased inside the gun. Things I would have changed: I would include better instructions. 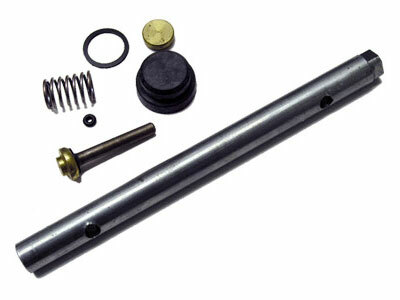 What others should know: Make sure this kit fits the airgun you are trying to fix. Things I liked: Very happy with the product. How often do the tools come with the parts. Great price too.